It may be hard to believe, but the prerelease for Rivals of Ixalan is just under two weeks away. That means—ready or not—that spoiler week is upon us! And with the New Year’s holiday, it’s a short week at that. Spoilers are dropping left and right, so rather than list all spoilers, let’s start with the highlights as of Tuesday. As a follow-up to a divisive limited environment, there are high hopes that Rivals of Ixalan shakes up the format. Whether that happens or not, we’ve seen some interesting mechanics so far. 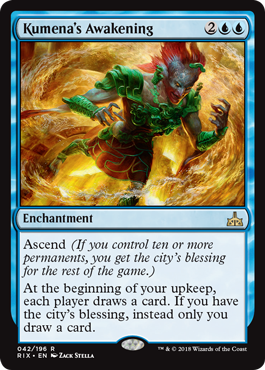 Of particular note is the “city’s blessing,” which is a designation a player can receive through cards with the Ascend keyword ability. If a non-permanent spell has Ascend, you receive the city’s blessing if you control ten or more permanents upon resolution. If a permanent has Ascend, the game constantly checks to see if you have ten permanents. 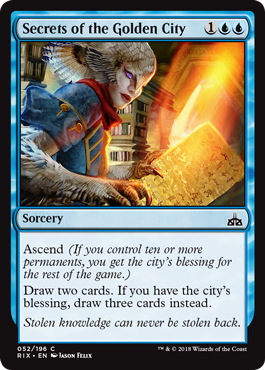 It does not use the stack, and the moment you control ten or more permanents, you gain the city’s blessing through the end of the game. Multiple players can get the city’s blessing, and there is no way to interact with or remove the blessing. Let’s take a look at some of the more interesting cards spoiled so far from Rivals of Ixalan. We’ll make some comments where appropriate along the way. 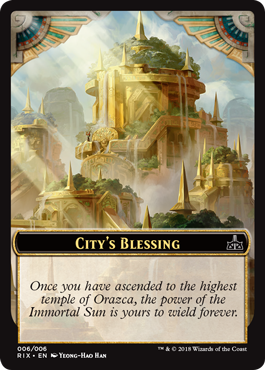 While Rivals of Ixalan includes a City’s Blessing token card, it’s important to note that the blessing itself is not a permanent of any kind. It can’t be interacted with at all, and is just a fact about the player(s) possessing the blessing for the remainder of the game. Cards played later in the game will just “see” that you once had at least ten permanents at the same time as resolving a non-permanent spell or controlling a permanent with Ascend. 2UU, T, Put ~ on the bottom of its owner’s library: Take an extra turn after this one. Activate this ability only if you have the city’s blessing. There are a lot of cool things going for Timestream Navigator. I’m not sure it’s fast enough to see Standard or Modern play, but I think there are applications in Commander. I am particularly excited to try her out in my Mairsil the Pretender build. Mairsil cares about activated abilities, and having a cost that tucks your commander away in a pinch may come in handy. It gets a lot more interesting, however, when you add Vedalken Aethermage. 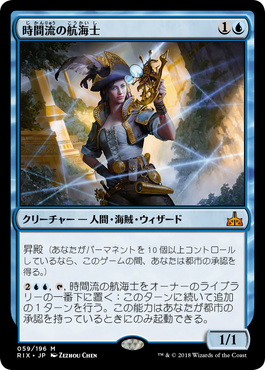 Both the Navigator and Mairsil are Wizards, which means the Aethermage’s unique Wizardcycling ability allows you to tutor for either, plus a whole slew of other relevant Wizards in the deck. If we’re going to Magical Christmas Land, take an extra turn with the Navigator’s ability, Wizardcycle for Mairsil, recast Mairsil, and find a way to recur Vedalken Aethermage. In the event that we don’t get an arbitrary amount of turns, we can get a relevant ability on Mairsil, an extra turn and an extra enter the battlefield trigger on Mairsil. We can then threaten to take an extra turn any time someone would wipe the board (and we’re in a safe position to get Mairsil back). When ~ attacks, you may put the top three cards of your library into your graveyard. When ~ dies, put all land cards from your graveyard onto the battlefield. As if The Gitrog Monster needed more tools in its disgusting arsenal. With as many lands as that deck can send to the graveyard, World Shaper‘s attack trigger is just gravy. Scapeshift to double your lands? Sure! Cycle and fetch lands doubled as well? Why not! If you see a Gitrog player cast World Shaper, someone at the table needs to exile it or the yard, as soon as possible. 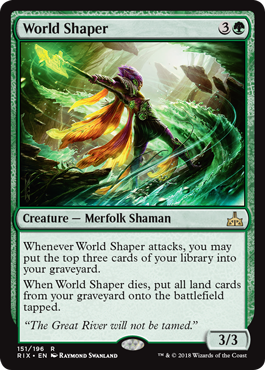 In Limited, the Shaper could turn out to be a bit of minor ramp, but it doesn’t seem like much of a bomb. When ~ enters the battlefield, destroy target creature an opponent controls. 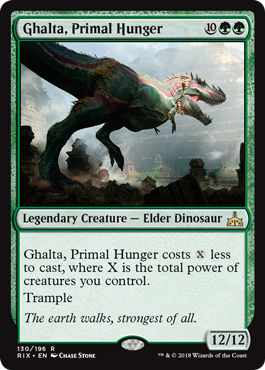 Nekrataal and similar creatures that leave behind a small body while destroying an opponent’s creature have always been powerful in Limited, and they find a home in Cube and Commander as well. 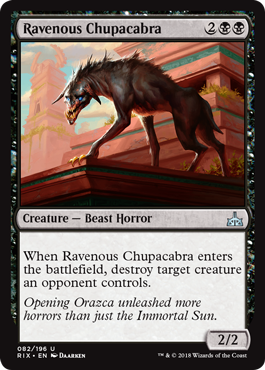 Ravenous Chupacabra may just replace Nekrataal, Skinrender and Bone Shredder in many cases. It may not be able to beat the cost of an evoked Shriekmaw, Ravenous Chupacabra just destroys an opponent’s creature outright. I would not be surprised if this becomes an easy first pick in the upcoming draft environment, and it will certainly find a home in certain Commander builds. +1: Put a loyalty counter on ~ for each creature you control. -1: Target creature gets +X/+X until end of turn, where X is the number of creatures you control. 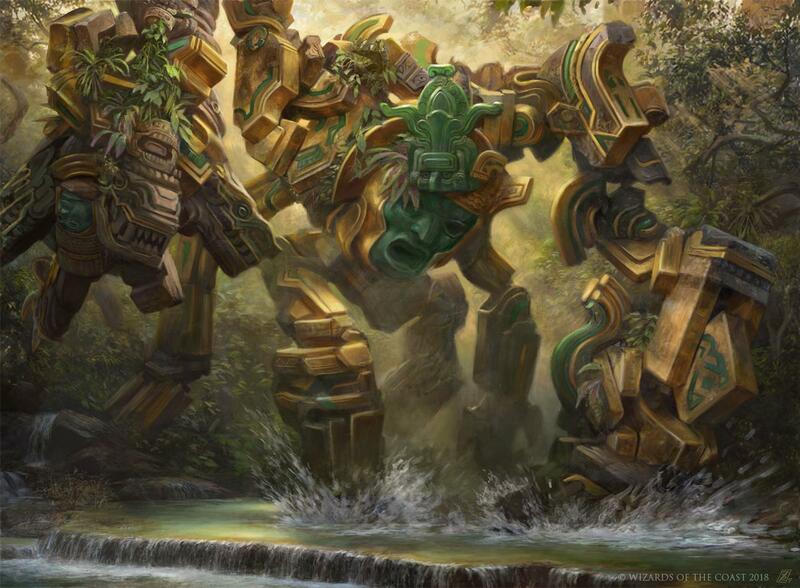 Huatli, Radiant Champion has a chance to help creature-heavy decks in Commander gain long-term card advantage—a serious issue with some builds. However, she may be too slow. 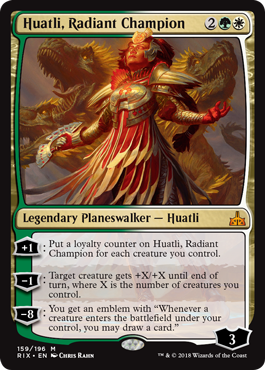 If your goal is to regain traction after a board wipe, Huatli will often come too late, since your only hope for an ultimate is to protect her for a turn while also controlling enough creatures that you only need to use her +1 ability once. I’m not so sure this will get there, in Commander or otherwise. 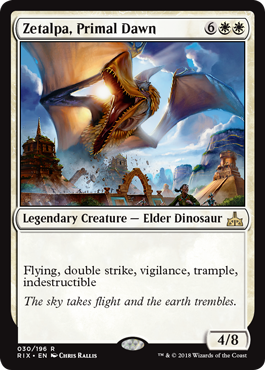 Flavor text: The sky takes flight and the earth trembles. If I’m spending eight mana on a creature, I would hope I get solid bang for my buck. Zetalpa, Primal Dawn has plenty going to justify that cost. Looking at those stats and keywords, you would think it’s an Angel, not Dinosaur, but here you go. It sure will end a game in draft or sealed fast. Outside of Limited, this could see play as a reanimator target, but it’s not certain those decks need another target. A merfolk lord at 2 CMC might be all that was needed to push blue-green merfolk into Standard. With plenty of other tools coming like Silvergill Adept, there could be some very aggressive fish on the way. 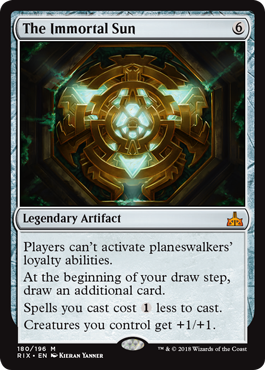 Players can’t activate planeswalker’s loyalty abilities. So this is The Immortal Sun—how many abilities can we stuff onto a 6-mana artifact? This card fits in with the like of Mirari’s Wake, Gauntlet of Power, etc. It will certainly help if the game goes long in Limited, but I will be more excited to see if this sees sideboard play in Standard. As a colorless card with this many powerful abilities, it will of course see Commander play. In my opinion, you will likely play this card specifically for the anti-planeswalker text, or with complete disregard to that clause. This is a versatile 6-drop that has just enough going on to find a home somewhere. When enchanted creature dies, return it to the battlefield under your control, then return ~ to the battlefield transformed under your control. Flavor text: …but every end is a new beginning. There have been a lot of effects like the front half of Journey to Eternity, but they rarely seem to see play. Reanimation is best when you are cheating on resources, and Journey doesn’t give you that option. Importantly, your opponent can 2-for-1 you by interacting with the creature you attempt to target it. They can also destroy the enchantment, or exile the creature to avoid a death trigger. All of that is pretty bad. 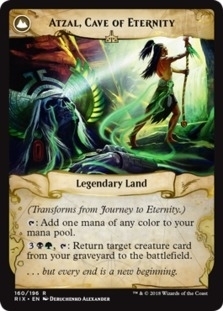 However, if you get Journey to Eternity into the graveyard on your own terms, it comes back as Atzal, Cave of Eternity, which allows you to return a creature card from your graveyard to the battlefield every turn. This sounds great, but it is likely too slow for most constructed formats. ~ costs X less to cast, where X is the total power of creatures you control. Flavor text: The earth walks, strongest of all. When ~ enters the battlefield, target player exiles all cards from his or her hand face down, then draws that many cards. When ~ is put into a graveyard from the battlefield, return the exiled cards to their owner’s hand. Without an on-demand method to sacrifice Induced Amnesia, the most likely use is to mess up an opponent who has spent some amount of resources setting up their hand. I don’t see that being worth a slot in the deck. 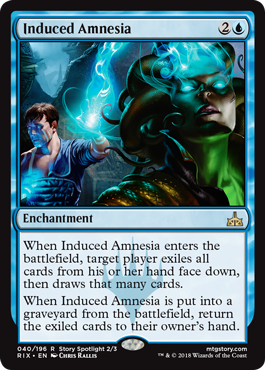 It is worth noting, however, that Induced Amnesia uses the older 2-clause templating rarely seen on newer cards, leaving some amount of room for shenanigans. Raid — If you attacked with a creature this turn, you may pay U rather than pay this spell’s mana cost. At the beginning of your upkeep, each player draws a card. If you have the city’s blessing, instead only you draw a card. 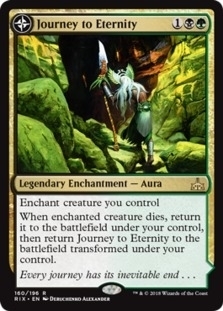 At first glance, Kumena’s Awakening is a card that looks great for Commander, but I think it might actually be quite bad. This is the kind of card that—whether reasonable or not—keeps eyes on your side of the table. Even if it’s not the most important permanent on the battlefield, casting it before having Ascend active means other players will constantly be tempted to eliminate your stuff to keep their card advantage going. If you do have the city’s blessing already, they will likely want to destroy Kumena’s Awakening. At four mana, the games aren’t necessarily worth playing for this one. When enchanted creature dies, exile cards equal to its power from the top of its owner’s library. You may cast nonland cards from among them for as long as they remain exiled, and you may spend mana as though it were mana of any type to cast those spells. 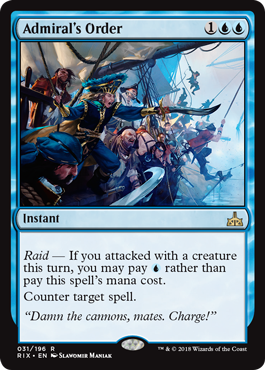 If nothing else, Dead Man’s Chest is another solid flavor win for the Ixalan block. If Energy remains a powerful deck in Standard post-Rivals, it will feel great to Enchant a Longtusk Cub. The obvious question that will need to be answered is whether the card advantage Dead Man’s Chest provides makes it better than spending a similar amount of mana to remove the Cub before it deals a massive amount of damage. 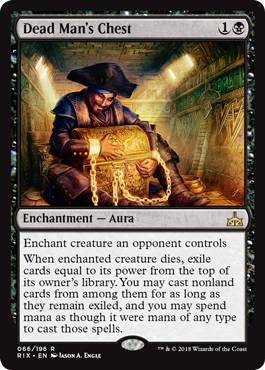 Since Energy is such a fast deck, the Chest might not cut it, but I would love to see a mid-range black deck running this and Gonti, Lord of Luxury for some true piracy. Draw two cards. If you have the city’s blessing, draw three cards instead. Flavor text: Stolen knowledge can never be stolen back. Three mana for three cards is a darn good deal. Sorcery speed deals a huge blow to Secrets of the Golden City, but in the mid to late game, it may be worth playing. Divination and Counsel of the Soratami saw play, so expect to see the same here in some capacity. Check back throughout the week for more spoiler highlights as we near the pre-release of Rivals of Ixalan on January 13th, 2018!